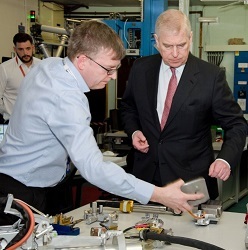 HRH The Duke of York visited UKAEA to see at first hand the pioneering work on fusion energy. He toured JET and was shown round the facility by officials from UKAEA, EUROfusion (the consortium that manages the JET research programme) and the European Commission. 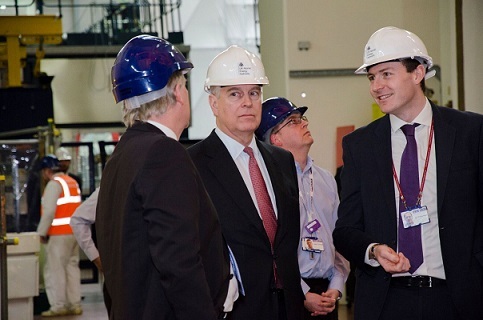 A keen advocate of UK business and innovation, The Duke also heard how the research at Culham Science Centre will help hi-tech companies to win contracts on major projects on the path to delivering commercial fusion power. The Duke also met UKAEA staff, including engineering apprentices from the Oxfordshire Advanced Skills centre, which is now training young people from around 20 hi-tech firms across the region as well as from UKAEA. UKAEA apprentice Thomas Eagles was one of those who got the chance to meet The Duke.